When you reach the age of 55, you have a new choice of lifestyle that wasn’t available to you before. Some active adult communities are deed-restricted for people who are 55+. It’s a neighborhood where people may live with peers who are at the same stage of their lives—pre-retirement, working part-time, or fully retired. Many have raised their children and are ready to focus on these years without the responsibility of parenting and careers. Is an active adult community right for you? You be the judge. You’ll live in a neighborhood of people your age. The active adult lifestyle is appealing to people who enjoy the company of others their age. They like having neighbors who share their interests and experiences. It’s both comforting and stimulating to be in close proximity to so many peers, with so many experiences to share. They have more available time, so their schedules will be more in synch with yours. You can get out on weekdays, when places are less crowded, without taking time off from work or finding a babysitter. You can relax and take your time, because, at this stage of your life, you’re ready, willing, and able to take it easy. You can enjoy younger people, without living among them. Do you relish the idea of a peaceful community? Maybe you’ve experienced younger neighbors who play loud music, host frequent parties that run late into the night, or have children who are very active up and down the street. While this type of diverse neighborhood is nice for some people, if you want more serenity, an active adult community is probably a better choice. When looking at active adult communities, be sure to learn their policy about having visitors and overnight guests who are younger than 55. Some communities place restrictions as to how many can visit, when, and for how long. If you like to host your family, including grandchildren, you don’t want to move to a neighborhood that restricts this freedom. Do community amenities and activities matter to you? Some subdivisions offer community amenities, like a swimming pool and clubhouse. An active adult community may incorporate amenities that appeal to the residents. You won’t have playgrounds, for example, and you won’t be sharing the pool with kids on a regular basis. 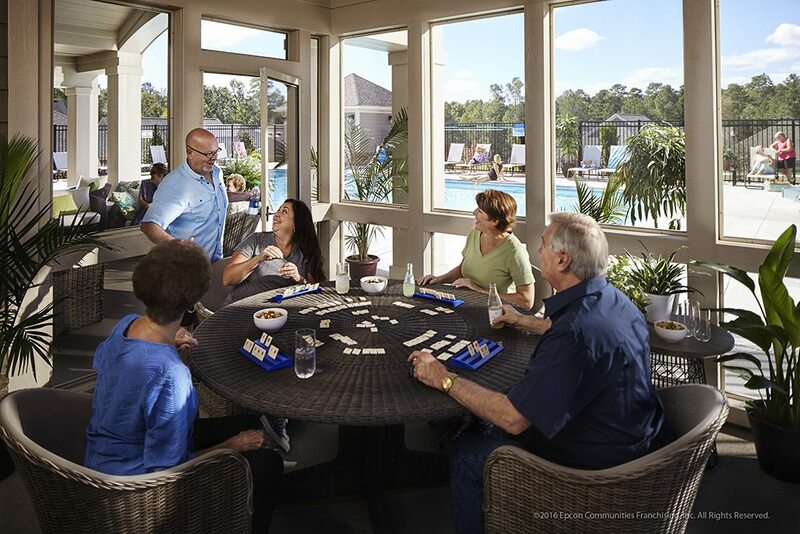 A 55+ community often presents opportunities for clubs and activities, like pot luck dinners and parties at the clubhouse, book clubs, regular card games, and organized outings for residents. The term “active” is key to these homeowners. They like to keep busy, stay social, and have fun. Are you looking for a new home, instead of a resale? The popularity of active adult communities has prompted more development, so you’ll probably discover that you can move into a new construction home by choosing the active adult lifestyle. With a new home, you can select the details and personalize your home, without the need for cosmetic changes or more complicated renovations to make your home more livable. A new construction home is also more energy-efficient than a resale home, built with the latest in eco-smart techniques, materials, and features. If you like the benefits that come with living in an active adult community, Epcon Communities presents the perfect option. We offer communities that are both age-restricted and not age-restricted. The lifestyle we present is very appealing to the 55+ homebuyers. The low-maintenance feature of our single-level, single-family homes has made Epcon Communities a popular favorite for active adults. The communities are located in so many regions that homeowners can often find one (or more) that’s convenient to their current home, their family, or both! If an active adult lifestyle is appealing to you, you belong in an Epcon community. Explore all the benefits we offer, and contact us to learn more.